Finally, the prophet considers the prayer of the priests, who turn to God with tears, saying: "Do not make your heritage a mockery, a byword among the nations. Why should it be said among the peoples, ‘Where is their God?’" (v. 17). This prayer makes us think of the importance of the witness of Christian faith and life given by each of us and our communities for showing the face of the Church, and how that face is sometimes disfigured. I think in particular of sins against the unity of the Church, and divisions within the body of the Church. To experience Lent in a more intense and manifest ecclesial communion, overcoming individualism and rivalry, is a humble and valuable sign for those who are distant from the faith or indifferent. What "good" are these wolves surrounding the Holy Father pushing for? Are these words being directed at a progressive element within the Church hierarchy that is pushing for a more liberal papacy? A progressive element that has pushed Pope Benedict XVI from the chair of St. Peter? While I believe that the Holy Father has left the papacy of his own accord, and that he has done so in a profound act of humility; I can't help but to wonder how many behind the scenes were there behind him manipulating, convincing him of his need to step down. And that the motivations behind such actions, while perceived to be "for the good" by those who are committing them, are arousing a great anger in God. On the feast of Saints Peter and Paul, June 29, 1820, she saw Saint Peter descending from heaven, robed in papal vestments and surrounded by a legion of angels. With his crosier he drew a great cross over the face of the earth, separating it into four quadrants. In each of these quadrants, he then brought forth a tree, sprouting with new life. Each tree was in the shape of a cross and enveloped in magnificent light. The small flock of faithful Catholics who had taken refuge under the trees will be brought before Saint Peter, who will “choose a new pope. All the Church will be reordered according to the true dictates of the holy Gospel. The religious orders will be reestablished and the homes of Christians will become homes imbued with religion. 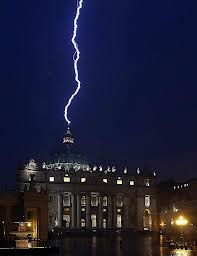 Rather amazingly, another lightning strike on St. Peter's Basilica has occurred in recent times - on the Feast of Ss. Peter and Paul, June 29th, 1995 - the exact feast day mentioned by Bl. Elizabeth Canori Mora concerning her vision of St. Peter descending from heaven! Christ is sending us out together, so that we may jointly bear witness to him. Thus we cannot remain separated! We must walk together, because this is Our Lord's will. The world must recover its faith at the end of the second millennium and at the start of the third! The Patriarch underlined "that today, happily... we have arrived at a maturity." The Pope, in turn, suggested that papal authority would have to be supreme in a unified Church because Christ had given Saint Peter, the first pope, free power to rule the flock on earth. Patriarch Bartholomew then asked Christians to pray and fast to oppose the power of the Devil and to drive out demons. At that exact moment, all the faithful were startled by a lightning bolt which struck the basilica, followed by a violent summer storm. The seventy-two returned with joy, saying, “Lord, even the demons are subject to us in your name!” And he said to them, “I saw Satan fall like lightning from heaven. Behold, I have given you authority to tread on serpents and scorpions, and over all the power of the enemy, and nothing shall hurt you. And he called them to him and said to them in parables, “How can Satan cast out Satan? If a kingdom is divided against itself, that kingdom cannot stand. And if a house is divided against itself, that house will not be able to stand. And if Satan has risen up against himself and is divided, he cannot stand, but is coming to an end. But no one can enter a strong man's house and plunder his goods, unless he first binds the strong man. Then indeed he may plunder his house. Christ entered the "strong man's house" through his Incarnation in the womb of the Virgin Mary - the Theotokos or "God-bearer", and bound him through His sacrificial death on the Cross, from where he descended into hell to free the captives before his glorious Resurrection from the dead. “I still have many things to say to you, but you cannot bear them now. When the Spirit of truth comes, he will guide you into all the truth, for he will not speak on his own authority, but whatever he hears he will speak, and he will declare to you the things that are to come. He will glorify me, for he will take what is mine and declare it to you. All that the Father has is mine; therefore I said that he will take what is mine and declare it to you." Following the Great Schism, the Church as the kingdom of Christ on earth was divided itself, allowing Satan to gain a foothold in the world once again. This would gradually facilitate the spread of Islam, the Protestant Reformation, the separation of Church and State, and the emergence of occult secret societies which have spearheaded the secularising forces causing the Great Apostasy we are enduring today. Although Christ reigns eternally as King in Heaven, where His Kingdom has no end, Jesus' teaching on the Kingdom of God was that it was both "now, and not yet" - what theologians refer to as "inaugurated eschatology". Whilst Christ taught that the Kingdom of God was now present in His own ministry, He also taught that it is something that will only be fully achieved in the future during the eschatological age. "Though already present in his Church, Christ's reign is nevertheless yet to be fulfilled "with power and great glory" by the King's return to earth. This reign is still under attack by the evil powers, even though they have been defeated definitively by Christ's Passover. Until everything is subject to him, "until there be realized new heavens and a new earth in which justice dwells, the pilgrim Church, in her sacraments and institutions, which belong to this present age, carries the mark of this world which will pass, and she herself takes her place among the creatures which groan and travail yet and await the revelation of the sons of God." That is why Christians pray, above all in the Eucharist, to hasten Christ's return by saying to him: Marana tha! "Our Lord, come!" 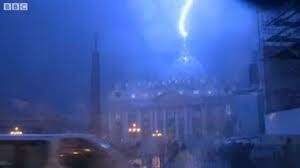 It seems that the lightning strike on St. Peter's Basilica, hours after Pope Benedict announced his abdication signifies the defeat of Satan. In a profound act of humility which is the complete opposite of Satanic pride, by stepping down as Supreme Pontiff it seems that the Holy Father has hastened the Devil's final defeat by bringing forward the reign of the Angelic Pope. The wolves' plans will be turned on their heads and the Church will be restored to its former glory. And the fifth angel blew his trumpet, and I saw a star fallen from heaven to earth, and he was given the key to the shaft of the bottomless pit. He opened the shaft of the bottomless pit, and from the shaft rose smoke like the smoke of a great furnace, and the sun and the air were darkened with the smoke from the shaft. Then from the smoke came locusts on the earth, and they were given power like the power of scorpions of the earth. This is to be equated with the "little while" mentioned in Rev 20:3, where we are told that Satan would be unleashed for a period before the end of the world, to gather the nations for war. I also argue that this time period began at the turn of the 20th century, and was marked by Pope Leo XIII's consecration of the world to the Sacred Heart of Jesus in 1899, in the same year as a rare planetary alignment that can be interpreted as "the keys to Death and Hades" (see the post The Seven Wandering Stars and the Heads of the Dragon). So just as the 1908 Tunguska event symbolised the angel unlocking the abyss at the start of Satan's "little while", so it seems that this new Russian meteor strike symbolises the fall of Satan and the closing of the abyss, when he is cast from heaven to earth at the end of his period of greater power. This is just over twelve years since the astronomical events at the turn of the millennium symbolised that the 100 years of greater power was over, and that Satan was defeated in Heaven (see the posts The Fall of Satan, Signs in the Sky and The Year of the Dragon). It is also interesting to note that the Book of Revelation states that the Apocalyptic Locusts wouldn't be able to harm people for "five months". According to Tyconius' Book of Rules (4th century AD) - one of the oldest books dealing with the interpretation of prophecy, days can be equated with weeks, months or years and vice versa in prophetic texts (e.g. Jeremiah's seventy weeks is reinterpreted as seven weeks of years - 7 x 70 - by the prophet Daniel). So the five "months" could mean five years in a prophetic sense. If we count five years from the Tunguska event in 1908, we arrive at the year 1913. Which brings us to just before the outbreak of WWI - when military aircraft were first put to use, and the first deaths by these "locusts" first began. So the locusts weren't allowed to kill people for five "months" (equalling years), but after this time period had elapsed, they were permitted to kill. So just as the effects of the 100 years of Satan's greater power were not felt until the outbreak of WWI in 1914, so it seems that the effects of the end of Satan's greater power after his defeat in Heaven would not be felt until 100 years after this - which brings us to up to this very moment. Now war arose in heaven, Michael and his angels fighting against the dragon. And the dragon and his angels fought back, but he was defeated, and there was no longer any place for them in heaven. And the great dragon was thrown down, that ancient serpent, who is called the devil and Satan, the deceiver of the whole world—he was thrown down to the earth, and his angels were thrown down with him. And I heard a loud voice in heaven, saying, “Now the salvation and the power and the kingdom of our God and the authority of his Christ have come, for the accuser of our brothers has been thrown down, who accuses them day and night before our God. And the LORD restored the fortunes of Job, when he had prayed for his friends. And the LORD gave Job twice as much as he had before. Then came to him all his brothers and sisters and all who had known him before, and ate bread with him in his house. On one occasion, while the crowd was pressing in on him to hear the word of God, he was standing by the lake of Gennesaret, and he saw two boats by the lake, but the fishermen had gone out of them and were washing their nets. Getting into one of the boats, which was Simon's, he asked him to put out a little from the land. And he sat down and taught the people from the boat. And when he had finished speaking, he said to Simon, “Put out into the deep and let down your nets for a catch.” And Simon answered, “Master, we toiled all night and took nothing! But at your word I will let down the nets.” And when they had done this, they enclosed a large number of fish, and their nets were breaking. They signaled to their partners in the other boat to come and help them. And they came and filled both the boats, so that they began to sink. But when Simon Peter saw it, he fell down at Jesus' knees, saying, “Depart from me, for I am a sinful man, O Lord.” For he and all who were with him were astonished at the catch of fish that they had taken, and so also were James and John, sons of Zebedee, who were partners with Simon. And Jesus said to Simon, “Do not be afraid; from now on you will be catching men.” And when they had brought their boats to land, they left everything and followed him. Seeing two boats out by the lake of Gennesaret, Christ gets into the one belonging to Simon Peter. After asking them to pull out a little from the land, he teaches the people in St. Peter's boat, and after he has finished speaking, he instructs those aboard exactly where to cast their nets. Simon Peter laments that they have toiled all during the night, and have took nothing. 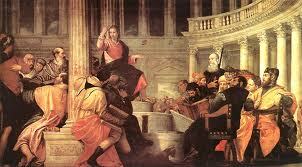 But Christ has been speaking to the people in St. Peter's boat since it first departed the shore with the Lord aboard. He who has been been with us "always, to the end of the age” (Matt 28:20). During the night-time of the Great Apostasy, the light of Christ's truth has been obscured by the "god of this world", and the crew of St. Peter's bark are lamenting because they have caught no fish. But Christ, who has been speaking to those on board St. Peter's boat all the while (through various private revelations), will show St. Peter exactly where to cast his nets, and they will enclose a very great number of fish. So many indeed, that the nets (clergy) will not be able to support the sheer weight of them. The crew of St. Peter's will have to signal to our partners in the other boat - the crew of St. Andrew, to come and help us, so that both boats will be filled. The "Glory of the Olive" and the Year 2012? Troyes Cathedral (Cathédrale Saint-Pierre-et-Saint-Paul de Troyes) in Champagne, France - the location of the relics of St. Malachy and St. Bernard of Clairvaux. "One from beyond the mountains shall become the Vicar Of God. Religious and clerics shall take part in this change. Outside the true path, there will be only disreputable men; I shrug my shoulders when the Bark of Peter is in danger and there is no one to lend it help... The schismatic shall fall into the scorn of the Italian faithful... By about twelve years shall the millennium have passed when the resplendent mantle of legitimate power shall emerge from the shadows where it was being kept by the schism. And beyond harm from the one who is blocking the door of salvation, for his deceitful schism shall have come to an end. And the mass of the faithful shall attach itself to the worthy Shepherd, who shall extricate each one from error and restore to the Church its beauty. He shall renew it." But another interesting fact is that in a book dating back to 1951 called La Mystérieuse prophétie des papes (Namur: Bibliothèque de la Faculté de philosophie et lettres, 1951, Imprimatur: June 28, 1945, Et. Jos. Carton de Wiart), Belgian Jesuit scholar Fr. René Thibaut attempted to demonstrate how the significance of St. Malachy's list of popes actually pointed to a specific year for the significance of the motto "Glory of the Olive" - the year 2012. Unfortunately, Fr. Thibaut's work remains unpublished in English. However, writing in 2009, Elena Maria Vidal summarises Fr. Thibaut's work at some considerable length in her blog Tea at St. Trinian's. Fr. Thibaut’s research reveals that there is a great deal more to the Prophecy than I had ever imagined. It is a penetrating treatise which, because of the author’s vast knowledge of Church history and Sacred Scripture, both informs and inspires. The middle of the book is devoted to charts tracing the date of Easter over the years, and the leap years, as well as various ciphers, anagrams and acrostics with which, as Fr. Thibaut demonstrates, the list of Popes is imbued. Fr. Thibaut’s analysis becomes complex at that point although he explains his conclusions with clarity. According to Fr. Thibaut, the papal legate Nicholas Sanders (1530-1581) may have brought a primitive document containing the Prophecy to Rome during the reign of St. Pius V. Sanders spent a great deal of time in Ireland, which continued to be Catholic in spite of Elizabeth I. Sanders wrote De visibili Monarchia Ecclesiae in which he states that the reigns of the popes are the best “measure of time.” (pp. 23-24) Fr. Thibaut believes that the Prophecy, eventually made public by Wion in 1595, has qualities which indicate an older document of Celtic origin, namely due to the word play and the use of numbers in the various anagrams and acrostics. (p.92) Reading Fr. Thibaut’s explanation of the complex patterns of words and numbers embedded in the list reminds me of the intricacy of the Celtic knot work designs in the Book of Kells and other Irish illuminated manuscripts, albeit the intricacy is in numbers and letters rather than designs. The final pope on the list is given the title Gloriae olivae, “The Glory of the Olive.” Fr. Thibaut says that the olive represents the people of God whom His judgment will glorify. (p.97) Once again, Fr. Thibaut insists that the Prophecy is genuine since so often in the last 400 years the titles have accurately described a pope and his reign, too many times for it to be pure chance. This is discussed in great detail and perhaps will be the topic of a future blog post. (To do full justice to such an exhaustive work is beyond the scope of one or two blog articles.) Fr. Thibaut ends by saying: L'année 2012 dira si, oui ou non, le prophête a vu clair. (p.101) That remains to be seen. You're right. I keep meaning to mention this. If the next pope is another elderly pontiff, I think this would rule him out from being the last pope, since a lot still has to happen. The era of peace/Second Pentecost promised by Our Lady of Fatima still has to happen. Once the Faith is rekindled in Europe, then a lot of prophecies (including the Church approved portion of La Salette) suggest that the Angelic Pope will anoint a new Holy Roman Emperor - the Great Monarch. Most of these prophecies point to the monarchy being restored in France, which isn't altogether implausible if the Eldest Daughter of the Church once again embraced the Faith. "France has corrupted the universe, one day it will be punished. The faith will die out in France: three quarters of France will not practice religion anymore, or almost no more, the other part will practice it without really practicing it. Then, after [that], nations will convert, the faith will be rekindled everywhere. A great country, now Protestant, in the north of Europe, will be converted; by the support of this country all the other nations of the world will be converted. According to Bl. Elizabeth Canori-Mora, Benedict XVI could be the pope who is "persecuted" - the one surrounded by wolves seeking to drag him from his throne. The next pope then could be the one no one expects. Maximin states that the peace will not last a long time however before the coming of the Antichrist. "After all these calamities have arrived, many will recognize the hand of God on them. They will convert, and do penance for their sins. A great king will go up on the throne, and will reign many years. Religion will re-flourish and spread all over the world, and there will be a great abundance. The world, glad to be lacking nothing, will fall again into disorder, will give up God, and will return to its criminal passions. [Among] God's ministers, and the Spouses of Jesus-Christ, there will be some who will go astray, and that will be the most terrible." So if we have a young pope (say his late fifties to early sixties), I'd say all this could take place over a 20-30 year period, and he could thus possibly be the last pope. But if we have an elderly pope, all this is a lot less likely to happen in (for talk's sake) another 8 year pontificate. So there would likely be another (indefinite) amount of popes after this, and St. Malachy's list of popes can be ruled out definitively. It can all be very difficult to get to grips with, but we'll know better in a few weeks when the new pope takes the helm. Also Birch's work contains many spurious prophecies of untraceable origin, which might mix things up a bit. He bases most of his research on Yves Dupont and Fr. Gerard Cullerton's books, which also don't cite original sources. Many of the Great Monarch prophecies he cites are also contradictory, for example. So it's best to work with private revelations of the highest level of approval, and discard any spurious prophecies that don't add up. (See the full text of the Church-approved 1851 text of the messages of La Salette here). Is the "Worthy Shepherd" the Last Pope? Following the hugely portentous events of the past few days, since Pope Benedict XVI announced his abdication on 11th February, 2013, I would like to add some more commentary as to what I believe is the prophetic significance behind these recent occurrences. As almost everyone on the planet already knows, just hours after the Holy Father announced his abdication, lightning struck St. Peter's Basilica twice. 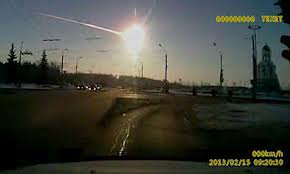 Whilst the odds of this occurring alone are almost unfathomable, just a few days later, the biggest meteor strike since the 1908 Tunguska event occurred (once again) in Russia, on 15th Feb - the exact same day an entirely unrelated asteroid narrowly missed the earth. The next day following the 2013 Russian meteor strike, on Feb 16th, a 4.8 magnitude earthquake hit near Rome. All this is to be considered in the backdrop of the apparent near fulfilment of the "Worthy Shepherd Prophecy", which foretold that a papal election would take place " around twelve year shall the millennium have passed". The Worthy Shepherd prophecy goes on to state that this new pope, who is to be equated with the Angelic Pope of Catholic prophecy, will ultimately result in the healing the Church of the Great Schism between the Roman Catholic and Eastern Orthodox Churches. 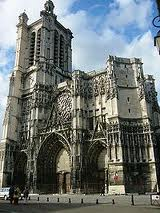 ...a Bishop dressed in White ‘we had the impression that it was the Holy Father'. Other Bishops, Priests, men and women Religious going up a steep mountain, at the top of which there was a big Cross of rough-hewn trunks as of a cork-tree with the bark; before reaching there the Holy Father passed through a big city half in ruins and half trembling with halting step, afflicted with pain and sorrow, he prayed for the souls of the corpses he met on his way; having reached the top of the mountain, on his knees at the foot of the big Cross he was killed by a group of soldiers who fired bullets and arrows at him, and in the same way there died one after another the other Bishops, Priests, men and women Religious, and various lay people of different ranks and positions. Beneath the two arms of the Cross there were two Angels each with a crystal aspersorium in his hand, in which they gathered up the blood of the Martyrs and with it sprinkled the souls that were making their way to God. If the hypothesis I present in my book is correct, then the Angelic Pope is to be equated with one of the Two Witnesses of Rev 11, who will "turn the hearts of fathers to their children and the hearts of children to their fathers" (Mal 4:6), before being killed by the "beast who rises up from the bottomless pit" (Rev 11:7). These are the two olive trees and the two lampstands that stand before the Lord of the earth. And if anyone would harm them, fire pours from their mouth and consumes their foes. If anyone would harm them, this is how he is doomed to be killed. They have the power to shut the sky, that no rain may fall during the days of their prophesying, and they have power over the waters to turn them into blood and to strike the earth with every kind of plague, as often as they desire. And when they have finished their testimony, the beast that rises from the bottomless pit will make war on them and conquer them and kill them, and their dead bodies will lie in the street of the great city that symbolically is called Sodom and Egypt, where their Lord was crucified. For three and a half days some from the peoples and tribes and languages and nations will gaze at their dead bodies and refuse to let them be placed in a tomb, and those who dwell on the earth will rejoice over them and make merry and exchange presents, because these two prophets had been a torment to those who dwell on the earth. But after the three and a half days a breath of life from God entered them, and they stood up on their feet, and great fear fell on those who saw them. Then they heard a loud voice from heaven saying to them, “Come up here!” And they went up to heaven in a cloud, and their enemies watched them. And at that hour there was a great earthquake, and a tenth of the city fell. Seven thousand people were killed in the earthquake, and the rest were terrified and gave glory to the God of heaven. So if the Worthy Shepherd Prophecy is authentic and correct (which it so far appears to be), and the Angelic Pope will be elevated to the papacy during the next conclave, there is a very real chance that this will indeed be the last pope. The same pope seen in the vision of the Third Secret of Fatima, which apparently depicts the final persecution of Christians under the Antichrist. Many wise men have thought about this. Reflecting upon divine wisdom, the knowledge of the saints, the truths of history, as well as prophecies both sacred and solid (like those of the Sibyls, of Merlin, of Aquila, of Festo, and of many other wise men), they have thought that the days of the Antichrist would come in this period. Therefore it is necessary that evil be stamped out so that God's elect plainly appear. A very holy pope will first come who will remove all the corruptions in education and the Church and all the rest. Then the world will be renewed and the fullness of peoples will enter in; even the remnants of Israel will be converted to the faith. Whilst the possibility that the next Sovereign Pontiff will be the last pope hinges on the equivalence of the Worthy Shepherd/Angelic Pope prophecies with that of St. Malachy's Petrus Romanus, these recent heavenly portents give us pause for thought. The amount of material needed to do justice to all of this is going to be quite vast, so I will have to break it up into several different posts. Bl. 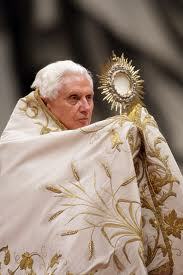 Elizabeth's Prophecy of Pope Benedict and the "Wolves"? "Behold, I am sending you out as sheep in the midst of wolves, so be wise as serpents and innocent as doves. Beware of men, for they will deliver you over to courts and flog you in their synagogues, and you will be dragged before governors and kings for my sake, to bear witness before them and the Gentiles. When they deliver you over, do not be anxious how you are to speak or what you are to say, for what you are to say will be given to you in that hour. For it is not you who speak, but the Spirit of your Father speaking through you. Brother will deliver brother over to death, and the father his child, and children will rise against parents and have them put to death, and you will be hated by all for my name's sake. But the one who endures to the end will be saved." But the Holy Father's words also appear to echo the prophecies of Bl. Elizabeth Canori-Mora (you can find some biographical information on Bl. Elizabeth at Catholic Online here), which are strongly reminiscent of those of Fatima. At the request of her confessor, Bl Elizabeth began to record her revelations, which ended up spanning hundreds of notebooks, and are now stored in the archives of the Trinitarian Fathers at San Carlino, Rome. Beneath the two arms of the Cross there were two Angels each with a crystal aspersorium in his hand, in which they gathered up the blood of the Martyrs and with it sprinkled the souls that were making their way to God. In the earlier posts The Two Witnesses and Prophecies of the Martyr-Pope, we discussed how these two angels appear to represent the two cherubim which adorned the Mercy Seat of the Ark of the Covenant, and that they also may symbolise the Two Witnesses described in the Book of Revelation. Bow your heavens, O LORD, and come down! Touch the mountains so that they smoke! Flash forth the lightning and scatter them; send out your arrows and rout them! Stretch out your hand from on high; rescue me and deliver me from the many waters, from the hand of foreigners, whose mouths speak lies and whose right hand is a right hand of falsehood. Note that the imagery in the above passage in Psalm 144 evokes not only imagery of volcanic eruptions "Touch the mountains so that they smoke! ", but also that of a flood "deliver me from the many waters". (See the earlier post The Casting Down of Mountains for an overview of the many other passages in the Bible which connect the Second Coming with earthquakes, volcanoes and massive floods). On Christmas, 1816 Blessed Elizabeth saw Our Lady, who appeared extremely sad. Upon inquiring why, Our Lady answered, “Behold, my daughter, such great ungodliness.” Blessed Elizabeth then saw “apostates brazenly trying to rip her most holy Son from her arms. Confronted with such an outrage, the Mother of God ceased to ask mercy for the world, and instead requested justice from the Eternal Father. Clothed in His inexorable Justice and full of indignation, he turned to the world. “At that moment all nature went into convulsions, the world lost its normal order and was filled with the most terrible calamity imaginable. This will be something so deplorable and atrocious that it will reduce the world to the ultimate depths of desolation.” (See here). With your and my prayer it is possible to mitigate this tribulation, but it is no longer possible to avert it, because only thus can the Church be effectively renewed. How many times has the renewal of the Church sprung from blood! This time, too, it will not be otherwise. We must be strong and prepared, and trust in Christ and His Mother, and be very, very assiduous in praying the Rosary." It also recalls the words of Our Lady of Akita: "If sins increase in number and gravity, there will be no longer pardon for them". On the feast of Saints Peter and Paul, June 29, 1820, she saw Saint Peter descending from heaven, robed in papal vestments and surrounded by a legion of angels. With his crosier he drew a great cross over the face of the earth, separating it into four quadrants. In each of these quadrants, he then brought forth a tree, sprouting with new life. Each tree was in the shape of a cross and enveloped in magnificent light. All the good laity and religious fled for protection underneath these trees and were spared from the tremendous chastisement. “Woe! Woe to those unobservant religious who despise their Holy Rules. They will all perish in the terrible chastisement together with all who give themselves to debauchery and follow the false maxims of their deplorable contemporary philosophy! “The sky took on a morbid blue color which terrified everyone who looked at it. A dark wind blew everywhere. An impassioned and mournful shrieking filled the air, like the terrible roar of a fierce lion, and resounded all over the earth in blood curdling echoes. “When this bloody fight will arrive, the vengeful hand of God will weigh upon these fated ones and with His omnipotence He will chastise the proud for their rashness and shameless insolence. God will use the powers of darkness to exterminate these sectarian, iniquitous and criminal men, who plot to eradicate the Catholic Church, our Holy Mother, by tearing Her up by Her deepest roots, and casting Her on the ground. The reference to those who seek to eradicate the Church can only refer to the secularising forces sponsored by Freemasonry (See the earlier post The Synagogue of Satan). For those seeking a more in-depth treatment of the life of this inspirational woman, there is an out of copyright book on the life of Bl. Elizabeth Canori Mora availble freely online here. Is the Worthy Shepherd Prophecy About to be Fulfilled? Benedict XVI - Pope Emeritus? The Worthy Shepherd Prophecy is cited in a book called Miscellanea Francescana 1, edited by M. Faloci Pulignani, dating to 1886. This book in turn appears to base at least some of its information on a facsimile dating to the late 15th century called Legenda de' Beati del Terzo Ordine Sancto Francisco, (ed L. Temperini, Rome: Editrice Franciscanum, 1996), which contains the Legenda of Bl. Tomasuccio de Foligno - as recorded by his companion and disciple Giusto della Rosa. In a post written in Jan 2013 (which can be found here), I attempted to show how the Worthy Shepherd Prophecy may be connected to the 2000th anniversary of the Finding in the Temple, which will be celebrated this Easter - which we now know will be at around the same time as the election of the new pope. In addition to the above correlations, it is interesting to note that the year 2013 will mark the 2000th anniversary of the finding of Jesus in the Temple (the fifth Joyful Mystery of the Rosary), after the Holy Family had lost the adolescent Christ (the third sorrow of Mary). If Jesus was one on 25th December 1AD, his twelfth birthday would have been celebrated on 25th December 12AD, making the Passover of 2013 the 2000th anniversary of the Finding in the Temple. Although modern scholarship has suggested that the actual year of Jesus' birth may have been some years earlier, Catholics still use the Anno Domini numbering system to celebrate anniversaries and jubilees connected to the life of Jesus. So the Anno Domini system still retains the primary symbolic value for Christians, given that we have no other uncontested means of celebrating anniversaries surrounding the life of Christ. Now his parents went to Jerusalem every year at the Feast of the Passover. And when he was twelve years old, they went up according to custom. And when the feast was ended, as they were returning, the boy Jesus stayed behind in Jerusalem. His parents did not know it, but supposing him to be in the group they went a day's journey, but then they began to search for him among their relatives and acquaintances, and when they did not find him, they returned to Jerusalem, searching for him. After three days they found him in the temple, sitting among the teachers, listening to them and asking them questions. And all who heard him were amazed at his understanding and his answers. The Jewish custom of the Bar Mitzvah, is analogous to the sacrament of confirmation in Catholicism (when we receive the Gift of the Holy Spirit), given that both rituals are conferred around adolescence - the age of reason or accountability. So we can only hope and pray that during the Year of Faith in 2013, the Church will receive the Gift of the Holy Spirit promised during the Second Pentecost, which will usher in the beginning of the age in which the fortunes of the Church will be restored; and like Mary and Joseph, the former world of Christendom will find the Christ who has been lost to it. Maybe upon this renewed discovery of Christ, we too will be "amazed at his understanding and his answers", when the hidden meaning of Scripture is revealed to the doctors of the Church. “I do not ask for these only, but also for those who will believe in me through their word, that they may all be one, just as you, Father, are in me, and I in you, that they also may be in us, so that the world may believe that you have sent me. The glory that you have given me I have given to them, that they may be one even as we are one, I in them and you in me, that they may become perfectly one, so that the world may know that you sent me and loved them even as you loved me." As we have noted previously, when describing the content of the Secrets of Fatima during one of her rare interviews, Sr. Lucia explicitly stated that they concerned chapters 8 to 13 of the Book of Revelation (See De la Sainte Trinite, M. The Whole Truth About Fatima, Volume III p533). So in order to discover the central essence of the secrets of Fatima, we are encouraged to draw comparisons with this portion of Scripture. Doing so is no easy task, given that there are no obvious or immediate parallels to Rev 8-13 given in the secrets. But it is fairly obvious that much of the content of the secrets is directly related to the tumultuous events of the 20th century - with an especial significance attached to the two World Wars. The apparitions at Fatima occurred in the midst of the First World War, at the exact moment of the rise of Soviet Russia - which is a central focus of the secrets. In addition, the Second Secret famously predicted the great Aurora Borealis of 1938, which heralded the dawn of the Second World War. It would thus logically follow that Our Lady of Fatima has communicated to us that chapters 8-13 of the Apocalypse are largely concerned with the events of the wartime period - including the Jewish Holocaust. 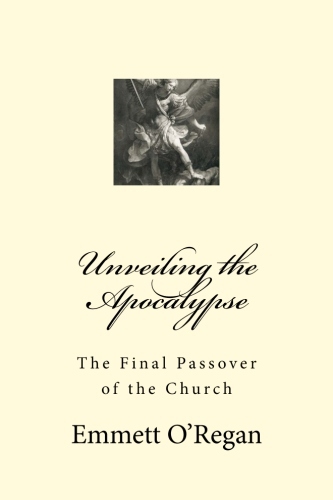 This was a factor which I took into serious consideration when writing my book Unveiling the Apocalypse: Prophecy in Catholic Tradition, and helped to steer the development of the interpretations given in it. If the secrets concerned both the world wars and Revelation chapters 8-13, then it allows us to concentrate any interpretation of this section of the Apocalypse on these past historical events. And when we do so, the interpretations begin to take a life of their own. The war is going to end: but if people do not cease offending God, a worse one will break out during the Pontificate of Pius XI. When you see a night illumined by an unknown light, know that this is the great sign given you by God that he is about to punish the world for its crimes, by means of war, famine, and persecutions of the Church and of the Holy Father. To prevent this, I shall come to ask for the consecration of Russia to my Immaculate Heart, and the Communion of reparation on the First Saturdays. If my requests are heeded, Russia will be converted, and there will be peace; if not, she will spread her errors throughout the world, causing wars and persecutions of the Church. The good will be martyred; the Holy Father will have much to suffer; various nations will be annihilated. In the end, my Immaculate Heart will triumph. The Holy Father will consecrate Russia to me, and she shall be converted, and a period of peace will be granted to the world. The prophet Daniel was told that his people (i.e. the Jewish people), or "the saints of the Most High", as he also refers to them, would be attacked and prevailed over by the "Little Horn" - who is to be equated with the False Prophet in the Book of Revelation. But Daniel states that God would intervene to save His chosen people, and the "Little Horn" would be destroyed. The dominion of the "kingdom" possessed by the beast like a leopard would then be given to the "saints of the Most High", and the "kingdoms" represented by the other three beasts would be allowed to continue for a while, minus control over this dominion. As I looked, this horn made war with the saints and prevailed over them, until the Ancient of Days came, and judgment was given for the saints of the Most High, and the time came when the saints possessed the kingdom. These events were foreshadowed in the persecution of the Jews by the Seleucid ruler Antiochus IV Epiphanes, who perpetrated the original "abomination of desolation" by erecting an altar dedicated to Zeus on the Temple Mount. Epiphanes was eventually overthrown by Judas Maccabeus and the Holy Land was restored to the Jewish people circa 165BC. So it is important to keep in mind the relationship between the "abomination of desolation" and the Jewish restoration. So Card. Bertone - who we must remember is one of foremost experts on this subject, having been the highest level official sent to interrogate Sr. Lucia directly after the publication of the Third Secret, and one of the few people privy to her entire writings - believes that the events of the Holocaust may be either a part of the interpretation of the Secret, or "a further development of it". This insight prompts us explore this suggestion further, in an attempt to discover any other references to the Holocaust in the words and writings of Sr. Lucia concerning the Secrets of Fatima. And we find that one of the most obvious links between the Secrets of Fatima and the Jewish Holocaust is in the appearance of Our Lady herself - who in an apparent act of solidarity with the future plight of her fellow Jews, bore a yellow star on her tunic during her appearances to the shepherd children. Sister Lucia gave detailed descriptions of Our Lady of Fatima to Fr. Thomas McGlynn, an American sculptor who was commissioned to make the official statue that would be used to decorate the front of the Basilica. This statue, sculpted under the direct supervision of Sr. Lucia herself, is a more accurate representation of Our Lady of Fatima, and is to be differentiated from the more famous pilgrim statue. "Her feet rested on the azinheira (a small holm oak tree). The leaves of the azinheira were small, as it was a young tree. The leaves did not bend down." This was a shock to Tom who thought that Our Lady had appeared on a cloud, a form he considered to be appropriately artistic. Lucy added, "She always had a star on her tunic. She always had a cord with a little ball of light,' and she indicated an imaginary pendant around the neck falling down near the waistline." She explained that there were only two garments visible, a simple tunic and a long veil or mantle. The tunic had no collar and no cuffs. Nor was there a cincture or a sash around the waist, although the tunic was drawn in at the waist. The sleeves were not wide, and the mantle and the tunic were a wave of light. When Tom asked her how one distinguished between the mantle and the tunic, she said, "There were two waves of light, one on top of the other." When Tom asked her if there was a line of gold on the mantle, she explained "It was like a ray of sunlight all around the mantle." She further explained that this ray around the mantle was like a thin thread. The mantle in Tom's sculpture was a long, oval contour, which he treasured. Lucy said, "It seemed to be straighter. It was a thing all made of light and very light, but it fell straight down. The clothing was all white. The cord was a more intense and yellow light.... The light of Our Lady was white and the star was yellow." Fr. McGlynn asked if she meant gold. "No. Yellow! She was all of light. The light had various tones, yellow and white and various other colours. It was more intense and less intense. It was by the different tones and differences of intensity that one saw what was hand and what was face and what was mantle and what was tunic." This attention to detail was obviously of great importance to Sr. Lucia, who must have considered every last feature of the apparition to be of deep symbolic importance. And the fact that she insisted that the star was yellow and not gold in colour immediately conjures images of the yellow star that would be forcibly imposed upon the Jewish population of the Third Reich. Every Jew in Nazi-occupied Europe was forced to wear a yellow Star of David with the word Jude (or its equivalents in other countries, e.g. Juif, Jood, etc. ), which was intended as a "badge of shame" in order to distinguish them from the rest of the population. In the previous post, we have already noted how after Sr. Lucia's death on the 13th Feb, 2005, a connection was made between the star on the tunic of Our Lady of Fatima and the Star of Esther, in an article titled Hidden Revelations: The Star of Esther and the Secrets of Fatima by Marianna Bartold. It will be worth recapping the main thrust of this argument again here, as the central theme of the biblical story of Esther is her role in rescuing the Jewish people from the threat of total annihilation - which in many ways prefigures the looming threat of a Jewish Holocaust in the 20th century. In her article (linked to above), Bartold connects the star depicted on the tunic of Our Lady of Fatima to the biblical tale of Esther, the famed Jewish Queen who interceded to save her people from destruction on the 13th of the month of Adar - an event which is still remembered by Jews today during the festival of Purim. 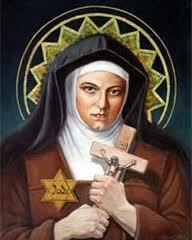 Bartold notes that the Hebrew month of Adar roughly corresponds to February in the Gregorian calendar, highlighting the significance of this connection in relation to the date of the death of Sr. Lucia on 13th Feb, 2005. Because of a use of a lunar calendar system, the Hebrew months shift back and forward slightly each year, as opposed to the Gregorian calendar which has dates that are firmly fixed. So the 13th February would certainly be the best (and perhaps only) date in the Gregorian calendar that could be used to symbolically point to the 13th Adar. We have already noted how Queen Esther's name is etymologically linked to the Morning Star - being a variation of the name Ishtar (see here). Additionally, Queen Esther was given the Hebrew name Hadassah at birth - a word meaning "myrtle", which is a small evergreen tree known for having a star-like flower with five petals. So in both her given names, Queen Esther was associated in some way with a star, making this symbol doubly apt in referencing this biblical tale. The connection between the Star of Esther and Our Lady of Fatima is further bolstered by the fact that the apparitions always occurred on the date of the 13th of each month - which once again recalls Esther interceding to save the Jewish people from destruction on the 13th of Adar. The Book of Esther is set during the reign of King Ahasuerus of Persia (who has been variously identified with Xerxes I, Artaxerxes I and Artaxerxes II), and focuses on the Jewish diaspora of the post-exilic period. We are told that Esther was orphaned at a young age and raised by her cousin Mordecai, who brought her up at his own daughter. When King Ahasuerus was spurned by his queen Vashti, the ruler sought to replace her with a new queen, and ordered for all the beautiful girls of the land to be presented to him. Keeping her Jewish identity hidden, Esther was taken before Ahasuerus, and the enamoured monarch made her queen in Vashi's stead. So, as they had made known to him the people of Mordecai, Haman sought to destroy all the Jews, the people of Mordecai, throughout the whole kingdom of Ahasuerus. Letters were sent by couriers to all the king's provinces with instruction to destroy, to kill, and to annihilate all Jews, young and old, women and children, in one day, the thirteenth day of the twelfth month, which is the month of Adar, and to plunder their goods. When the 13th Adar would come round, each citizen of the empire would be free by royal command to slaughter the Jews and despoil their property. Upon learning of this plot to destroy all the Jews in the empire, Mordecai beseeches Queen Esther to intercede for them to the King. And at great risk to her own life, Esther then bravely entered unbidden into the the royal court in an attempt to save her people. It has rightly been noted that on a symbolic level, each of the main characters of the Book of Esther correspond to heavenly counterparts - which is something to keep in mind here. King Ahasuerus represents God, while the evil Haman symbolises the Devil. Queen Esther in turn parallels the Virgin Mary, the Queen of Heaven who intercedes for her people - while the good, fatherly-figure of Mordecai can be equated with St. Joseph. The king's scribes were summoned at that time, in the third month, which is the month of Sivan, on the twenty-third day. And an edict was written, according to all that Mordecai commanded concerning the Jews, to the satraps and the governors and the officials of the provinces from India to Ethiopia, 127 provinces, to each province in its own script and to each people in its own language, and also to the Jews in their script and their language. And he wrote in the name of King Ahasuerus and sealed it with the king's signet ring. Then he sent the letters by mounted couriers riding on swift horses that were used in the king's service, bred from the royal stud, saying that the king allowed the Jews who were in every city to gather and defend their lives, to destroy, to kill, and to annihilate any armed force of any people or province that might attack them, children and women included, and to plunder their goods, on one day throughout all the provinces of King Ahasuerus, on the thirteenth day of the twelfth month, which is the month of Adar. We are then told of the complete reversal of the fortunes of the Jews on the 13th Adar, when their enemies' plans were turned on their heads. Now in the twelfth month, which is the month of Adar, on the thirteenth day of the same, when the king's command and edict were about to be carried out, on the very day when the enemies of the Jews hoped to gain the mastery over them, the reverse occurred: the Jews gained mastery over those who hated them. So instead of being destroyed on the 13th Adar, the Jews won victory over their enemies. The next day, when news of this victory began to spread (on the 14th Adar), is still celebrated today as the feast of Purim. 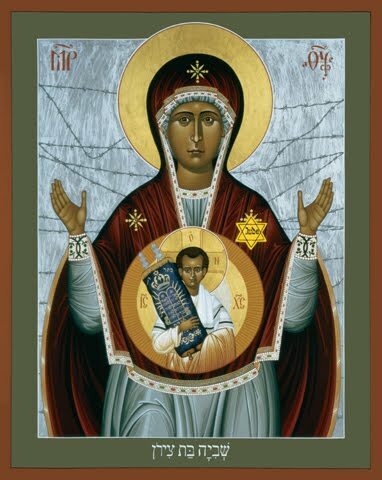 In directing us to Queen Esther interceding to spare the Jews from complete annihilation in the words of Holy Scripture, it seems almost certain that Our Lady of Fatima (bearing the yellow star of Esther in sympathy with her fellow people) was warning of the horrors of the Holocaust that was to come. The story of Queen Esther, which tells of the threat of the Jews being completely destroyed, but is then turned into a moment of victory, directly parallels the situation under Antiochus IV Epiphanes, when the persecution of the Jews by this wicked Seleucid ruler was turned on its head, and the Holy Land was restored to the people of Israel under the Maccabees. It is interesting then to note that just after the last apparition of Our Lady at Fatima, coinciding with the Miracle of the Sun on 13th October, 1917, preparations for the restoration of Israel were already under way, with the issue of the Balfour Declaration by the British government on November 2nd, 1917 - calling for the establishment of a national home for the Jewish people in the land of Palestine. When control of Palestine fell into the hands of the British government in the wake of World War I, the Balfour Declaration was drafted into the British Mandate for Palestine. By rather ominous happenstance, a decisive victory that allowed Britain to take control of Palestine was won just a year later, during the Battle of Megiddo in 1918. And in the post Our Lady of Mt. Carmel: The Visions of Fatima and the Battle of Har Megiddo, we have already established how the Virgin Mary's appearance as Our Lady of Mt. Carmel during the Miracle of the Sun pointed to the significance of the Battle of Armageddon in the Book of Revelation (which as I argue in the book, will take place in the future as a direct consequence of these events). These occurrences, taking place in the same period as the apparitions of Our Lady at Fatima, paved the way for the restoration of Israel in the aftermath of the Second World War. It may be no coincidence then, that the Israeli Declaration of Independence was made on May 14th, 1948 - just a day after the anniversary of the first apparition of Our Lady of Fatima on May 13th, 1917. This correlates with the way in which the Feast of Purim is celebrated on 14th Adar - the day after the intercession of Queen Esther to save the Jews from destruction. Given the fact that the restoration of Israel took place exactly 1,260 years after construction began on the Dome of the Rock in Jerusalem (see the post The Abomination of Desolation), it seems inescapable from concluding that these events were highly prophetic in nature. Indeed the Third Secret itself appears to allude to the abomination of desolation spoken of in Scripture. The city on a hill with a large cross on top is a clear reference to Jerusalem, and the actions of the angels -gathering up blood and sprinkling it on the souls of the deceased, echoes the inner workings of the Temple performed by the Levite priesthood. The city being "half in ruins" points to one of the original, preterist meanings of the "abomination of desolation", when the Romans ransacked Jerusalem, destroying the Temple in 70AD. Just as the Book of Daniel tells us that the False Prophet, or "Little Horn", was prefigured in a persecutor of Jews - Antiochus IV Epiphanes; the Book of Revelation models the person of the Antichrist on a persecutor of Christians - the Emperor Nero (whose name forms the basis of the prophecy of the number of the Beast). Rather frighteningly, it appears that the Jewish Holocaust foreshadows a future Christian Holocaust under the Antichrist, in a manner which echoes the words of St. Paul: "first for the Jew, then for the Gentile" (Rom 1:16). "Didn't you see the Holy Father?" "I don't know how it was, but I saw the Holy Father in a very big house, kneeling by a table, with his head buried in his hands, and he was weeping. Outside the house, there were many people. Some of them were throwing stones, others were cursing him." "Is he the one I saw weeping, the one Our Lady told us about in the secret?" "Yes, he is," I answered. "The Lady must surely have shown him also to those priests. You see, I wasn't mistaken. We need to pray a lot for him." "Can't you see all those highways and roads and fields full of people, who are crying with hunger and have nothing to eat? And the Holy Father in a church praying before the Immaculate Heart of Mary? And so many people praying with him?" Some days later, she asked me: "Can I say that I saw the Holy Father and all those people?" "No. Don't you see that that's part of the secret? If you do, they'll find out right away." "All right! Then I'll say nothing at all." One day, I went to Jacinta's house to spend a little while with her. I found her sitting on her bed, deep in thought. "Jacinta, what are you thinking about?" "About the war that is coming. So many people are going to die, and almost all of them are going to hell! Many homes will be destroyed, and many priests will be killed. Look, I am going to heaven, and as for you, when you see the light which the Lady told us would come one night before the war, you run up there too." "Don't you see that nobody can just run off to heaven!" "That's true, you cannot! But don't be afraid! In heaven I'll be praying for you, for the Holy Father, for Portugal, so that the war will not come here, and for all priests." Here we are told that part of the secret concerns the sufferings of a pope, who while weeping and praying in the sanctuary of his own house (devastated by the plight of those hungering and thirsting as a result of the war), is slandered and heckled by those outside. The endnote to Lucia's Third Memoir identifies the pope of Jacinta's visions as Pius XII, stating: "There is every reason to assume that this refers to Pope Pius XII, the great Pope of the Immaculate Heart of Mary. "(Third Memoir, n17). 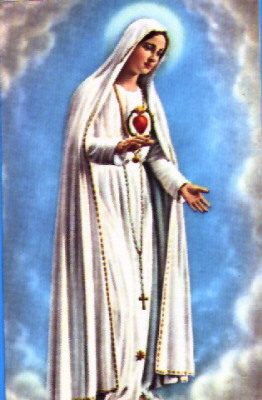 It was Pius XII who made the first attempt to fulfil Our Lady's request to consecrate the world to the Immaculate Heart of Mary, having done so on October 31st, 1942, just before major turning points in the war. Although it was acknowledged that this consecration didn't fulfil all the criteria specified by Our Lady (since it wasn't performed by all the world's bishops as well as the pope), it appears to have gained certain graces. The fall of Stalingrad began a few days later, on 19th November, 1942; with the surrender of the German forces on 2 Feb, 1943 - the Feast of the Presentation of Jesus at the Temple. Could the Secrets of Fatima be connected with the plight of Pope Pius XII during the war? This saintly pontiff has been wrongly lambasted by some elements of the media as "Hitler's Pope", for allegedly failing to condemn Nazi Germany's systematic slaughter of the world's Jews. The truth of the matter was that this holy Pope worked fervently to save thousands of Jews - which appears to be a truth reflected in Jacinta's vision. (See here for a neutral debate on Pius XII and the Holocaust). Is this the real meaning behind Jacinta's vision of those outside the pope's house, throwing stones and cursing him? The vision of the Holy Father weeping bitterly inside his own house perhaps provides an insight to the impossible dillemma Pius XII was presented with during this time.